There’s a lot of money in robo-investing nowadays—both from investors like me and VCs. Which means there’s also a lot of money being spent on marketing these fintech solutions to young investors. That’s where NerdWallet comes in. They’re a massive content site that helps consumers evaluate all kinds of personal finance options, from credit cards to savings accounts to brokers. They make money by referring traffic to actual finance companies. And they make a lot of money—the company was valued at $520 million in 2016, with projected annual revenue of $100 million a year. Where does NerdWallet get their traffic? The answer: almost entirely organic search. NerdWallet’s direct traffic is on the rise, too—partially because they’ve been conducting a major branding campaign using traditional TV ads. When you Google almost any question about personal finance, NerdWallet shows up in the SERPs. They’re a huge referrer of traffic to robo-advisor websites. In fact, NerdWallet sends more traffic to Wealthfront (the second-largest independent robo-advisor) than any other website. If you Google “robo-advisor,” NerdWallet is the #1 result. If you Google “rollover 401k,” the first result is NerdWallet. Same for “how does a roth IRA work,” “retirement advice,” and even “how to invest in stocks.” NerdWallet makes a great deal of money by answering questions that people Google and then referring those people to financial companies. In fact, I compared the organic traffic to NerdWallet’s investment articles alone against the organic traffic of six of the largest independent roboadvisors. NerdWallet outstrips them all in terms of organic search traffic—raking in more than double the hits from Google than the next contender, Betterment. They get a TON of organic traffic, and it’s the right traffic. Of course, there are a handful of caveats that should come to mind—especially if you’re familiar with the robo-investing vertical. NerdWallet writes about more than investing. They cover credit cards, loans, mortgages, savings accounts—pretty much everything from a personal finance standpoint. The blog subdirectory of their website alone contains more than 12,000 URLs. If you have a question about money, NerdWallet plans to have the answer. So to correct against this, I’ve narrowed this report down to only focus on investing-related content. 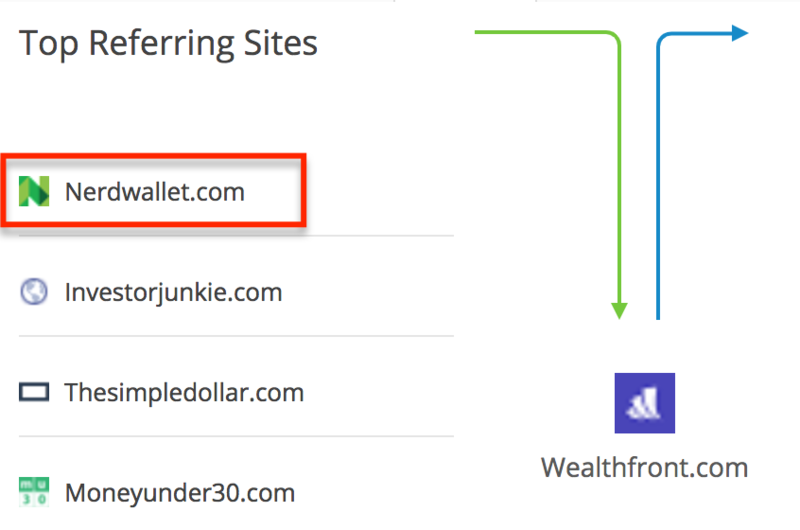 NerdWallet’s site structure makes that pretty easy: I’m just analyzing content that falls under the Nerdwallet.com/blog/investing subfolder. So that brought the page count down from 12,000 to “only” about 1,100 pages. NerdWallet is a third-party site with third-party advantages. They’re not operating under the same kind of regulatory or bureaucratic constraints as financial institutions. Plus, they get to write unbiased reviews of financial offerings, which carry a degree of trustworthiness that branded sites can’t. To correct against this, I’ve filtered out the reviews in the NerdWallet investing subfolder at the time of this report. This is a report on just the blog content—not the reviews. That brought the page count down to about 1,000 pages. I wanted to see exactly which pages a content marketer in the robo-advisor space could reasonably hope to compete on. Since NerdWallet doesn’t have loyalties to any single brand, they get to compare, contrast, and compile “best of” pages in any financial vertical. If you’re a content marketer, you probably don’t have the luxury of making these lists without some form of bias. (Which isn’t necessarily a bad thing.) But I want to see which NerdWallet pages are “open season” for anyone. So I further filtered out side-by-side comparison articles and “best of” pillar pages. That brought us down to about 950 pages. Even if we handicap NerdWallet on these three fronts, they’re still cleaning up the SERPs in the investing world. 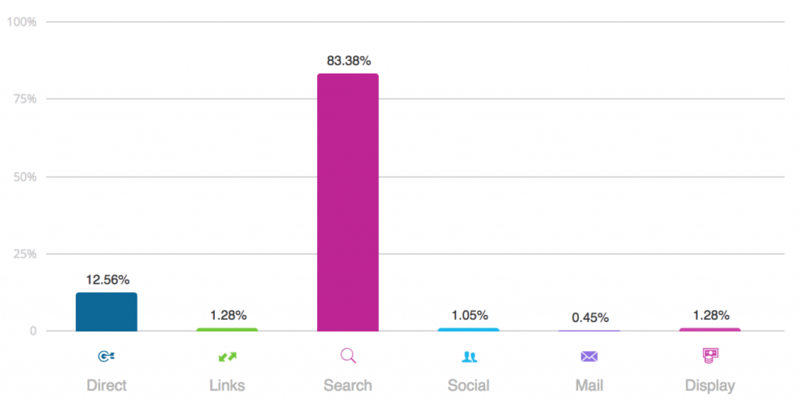 So … what kinds of articles are winning all this traffic? You saw earlier that the organic traffic that NerdWallet brings in to these articles would cost you about $3.4M if you were to buy it all via Google Ads. That number is estimated by Ahrefs—a tool that looks at clickstream data to see what keywords people are Googling, approximate how much traffic Google is sending to all these pages, and then multiplies that number by the going CPC of the keywords people use to find these pages. Once the algebra’s done, you get an estimated traffic value, which in NerdWallet’s case comes to about three and a half million bucks a month. And about 60% of that traffic value comes from the top 20 blog posts. I’ve examined these top posts to find out not only what kind of traffic they’re getting, and added a few tips anyone else could put to use if they wanted to compete with these posts in the SERPs. Most of these posts fall into two classic pillar categories: the “How to” posts and the “What is” posts. Most of the top 20 posts fall into the “How to” category. They give readers a guide that helps them understand how to tackle some financial problem that they’re Googling. Competitive tip: Give the visual learners something NerdWallet doesn’t. Finance is a cerebral subject, and while NerdWallet is strong on analytical content, they’re weak on visual explainers. Illustrate the process of getting started in the stock market, as well as how market and limit orders work—by making your content more appealing to visual learners, you’ll stand a better chance of winning backlinks. Competitive tip: If you’re a robo-advisor, play up the simplicity of investing that your solution provides. Give readers an up-front summary of how the process of investing works. Competitive tip: Summarize the pros and cons of rolling over a 401(k), and add a section about navigating taxation during a rollover. Competitive tip: Write a thorough summary of each type of financial advisor (human, digital, or hybrid), each on its own page. Link these pages to your own pillar page on what a financial advisor does and how to choose one. Competitive tip: Write a list of tips for those just beginning to trade stock. Competitive tip: Options trading is a heady subject: if you can illustrate how it works in an intuitive way, you’ll get more backlinks and you’ll have an easier time referencing it in your other content. Six of the top 20 posts introduce financial terms and programs to beginners. These are the more general explainer pieces—though they often give practical takeaways and next steps. 1. What Is a Brokerage Account and How Do I Open One? Competitive tip: Include a “How does a brokerage account work?” section. Competitive tip: [sniff, sniff] … you smell that? Sure smells like redundant content. Wrtie a killer beginner’s guide to options trading that covers the concepts in both this article and number 11 in the “How to” list above. 3. What Is a Solo 401(k)? 4. What Is the Stock Market and How Does It Work? Competitive tip: This page gives a high-level introduction to the idea of the stock market, but could be more advanced. Consider an illustrated overview of how stock markets work, a breakdown of stock markets by size, and the history of stock markets. A standalone page on each of the major stock markets can help build internal links. 5. What Is a SEP IRA? First, NerdWallet has completely committed to content creation and maintenance. This goes beyond having a single in-house content specialist or even a content team. NerdWallet manages more than a hundred contributors (spread across different verticals) and regularly keeps their content up to date. They’re not experimenting with SEO or content, they’ve made the decision to treat SEO as their primary strategy. Financial startups aren’t always inclined to go this route. The quick growth tends to be in paid acquisition—that’s where dollars spent can be most reliably measured against dollars made. Content is either time-consuming and/or expensive to research, produce, and promote. But as the online investing world becomes more competitive, I doubt the digital players will be as willing to allow media companies to own the conversation. Robo-advisors like Betterment and WealthSimple are already making bigger content plays. It’s only a matter of time before we start seeing more of the big financial incumbents (like Vanguard, Schwab, and Morgan Stanley) making grabs at the organic SERPs and not just the paid ones. They have a network of reviews. A network of best-of posts. And a network of valuable explainer pieces, including the ones listed above. And they take every opportunity to link their articles together. For the top 20 blog posts we covered above, the average number of internal links pointing to each page is 43. On average, each of these pages is referenced 43 times elsewhere on the site. This is a byproduct of having so much content. With all their investing-related articles, they have a hundred and one opportunities to link the term “robo-advisor” to their best-of list on the subject. No, seriously. They have about 101 pages on NerdWallet.com linking to their “Best robo-advisors” listicle, which they update every month. Needless to say, if you want to compete with NerdWallet, you’re going to need to clean up your blog. 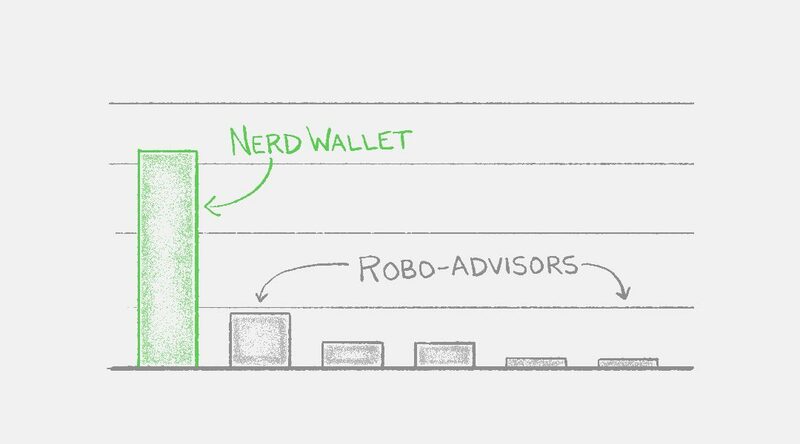 Most robo-advisors aren’t equipped to compete with NerdWallet—and they don’t have to. It’s easier to pay NerdWallet to refer traffic their way. For some of the players who can compete, there’s plenty of opportunity. As you can see, there’s a good deal of traffic to be grabbed just by defining finance terms and educating people on how the world of investing works. It will take time and (if you don’t want to wait forever) a good deal of cash, but a robo-advisor who went toe-to-toe with NerdWallet could stand to be the only player of its kind in the industry. By making an investment in content now, a robo-advisor (and certainly a large incumbent bank) can begin developing their own search engine audience. An audience you don’t need to pay NerdWallet to access.